Ask someone which seat he prefers on an airplane and more often than not you’ll get a passionate response. I always go for the window seat. Some people say they feel too closed in and claustrophobic in this seat, but I actually have that issue when I’m sitting on the aisle. As a former map maker, I also like sitting at the window so I can appreciate the earth from above. As far back as the first grade I was drawing aerial maps of my neighborhood. So it’s no surprise how excited I get when my window seat comes with a clear day and incredible view. Pretty neat, huh? I was sad to see that every single other window shade in my cabin was closed for the duration of the flight. I suppose not everyone is as captivated by the mountains as I am, but it still seemed like even the most frequent fliers were missing out on some impressive scenery. Since I was taking these pictures with my phone, I have GPS information for each of these locations. When I’m back on the ground and have some time I like to look up some of the more interesting locations, like Montgomery Pass, Nevada. For those who aren’t snapping pics from a GPS enabled device or who don’t have/want a window seat, a friend just told me about an app called Flyover Country. I’ve only looked at it from the ground so far, but it looks like a neat way to see what you (might) fly over. You enter your departure and arrival locations and the app shows you points of interest that lie inside a buffer around the line connecting the points you entered. Pretty cool! 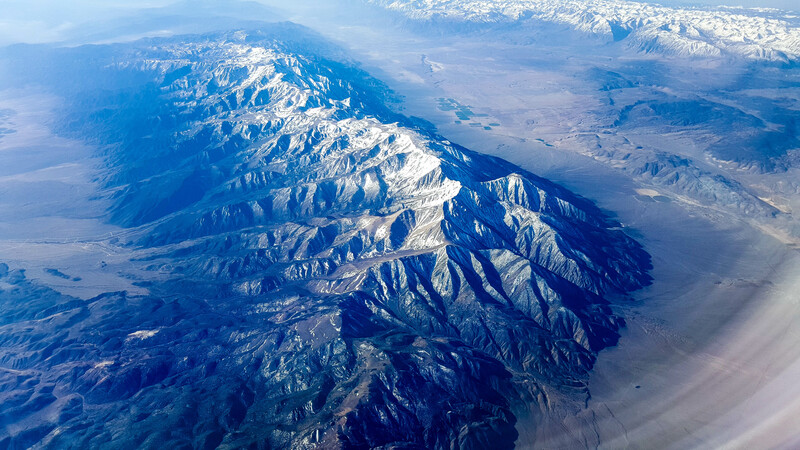 I have to admit that flying over the mountains of the west was a little bit more exciting than a lot of my travel that occurs around the midwest. What’s the coolest sight you’ve seen from your airplane window? Share in the comments! ← What’s in My Beach Bag?